1 Cut squash in half lengthwise. Scoop out and discard seeds. 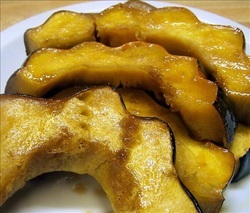 Cut squash crosswise into 1-inch slices. 2 Arrange slices slightly overlapping if needed, in a buttered 13 x 9 x 2-inch baking dish. Bake, covered, in a 375 degrees oven for 35 minutes or until almost tender. 3 Combine melted butter, brown sugar, syrup and cinnamon. 5 Continue baking, uncovered, 15 minutes or until squash is tender, basting occasionally with syrup mixture from bottom of pan. To make clean-up easier, line pan with aluminum foil.